Sense my old web site is goon and I have been asked about some of the engine animations there I thought for those interested I would put some of them here. The first is the controversial crank rod engine which has said to be a scotch yoke engine. But I can not find any scotch yoke site that uses the orbiting mechanism. I think Ken found an old steam engine design that used a this orbiting crank. BMW built an IC engine using this orbital crank mechanism. Can not find that on the web anymore. The orbital crank mechanism is based on analytical geometry. 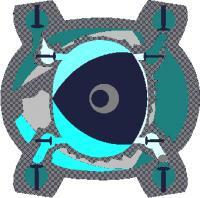 The Compound steam Wankel engine is another animation from my old site. It is like a steeple compound engine in timing. 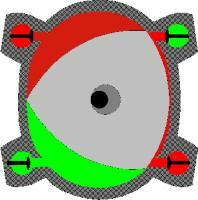 The exhaust of the high pressure rotor coincides with the admission of the low pressure rotor. The crank throws are 180 degrees apart while the chambers are rotated 90 degrees instead of being coincident like an IC engine. The high pressure chamber and rotor are small compared to the high pressure. Illustrated steam Wankel "double acting" animation shows how a single rotor would have overlapping power strokes. Power strokes are 180 degrees apart, lasting 270 degrees. The last image is of my boiler concept. The outside donut fire ring design. The boiler tubes are in the center with water starting in the iner most tubes and flow generally proceeding to the nest outer tube coil. This are configured as in the S.E.S. circuit design with a protected superheater section and the generating coils closest to the fire. The idea is to keep the gas flow rate high as the combustion gasses cool. The flow are is decreasing as the gasses proceed inward and finally exhaust out the center. You can see how this mush like the Cyclone steam generation. This was on my web site in 1993.